I’ve had some requests lately for more black and white tutorials, as well as one for some still life. So in this tutorial, you’ll learn how to use luminosity masks to create black and white images of flowers. Using contrast and brightness adjustments through luminosity masks in Lumenzia, you can shape the light to give your flowers more depth and interest. The black and white adjustment in Photoshop is very powerful, but you need to use it creatively to get the most out of it. Many times it is best to use different color conversions in different parts of the image. In this demo, the green tips of the flower should be lightened and the stems should be lightened. A single adjustment would cause one or the other to become a bit distracting. To use different conversions, just use a layer mask to target a B&W layer to one part of the image. Once part of the image is in grayscale, additional B&W adjustments have no effect. So you can simply add another B&W layer to apply different color slider values to the rest of the image. You can use as many layers as you want, but a couple is probably all that is needed. The “contrast” tool in Lumenzia analyzes any active selection or luminosity mask preview (the temporary orange layers from Lumenzia) to automatically create an apply a contrast enhancing curve to those areas. The simplest way to use the tool is to use the lasso tool in Photoshop to select an area, click “Contrast” in Lumenzia, and then adjust the new layer’s opacity to get as much or as little of the effect as you like. This is a great way to start shaping the image based on the existing light. Dodging and burning is a great way to bring out texture or depth in an image. When you want to adjust larger areas, using luminosity masks with a Brightness/Contrast layer offers another simpler way to get great results, and its perfect for an image like this. 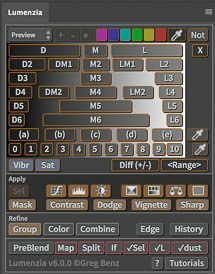 Use a combination of lasso selections and luminosity masks to target the specific areas of highlight and shadow you wish to adjust, and then tweak the brightness slider as needed. This is of course just one way you can edit black and white photos. For an even more powerful technique that I use on nearly all my B&W photos, be sure to check out dodging and burning with luminosity masks.